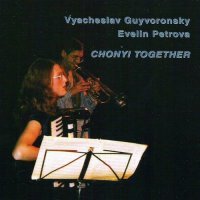 ..»Chonyi Together» is the duo’s first recording. Central for the record is its title track Chonyi Together, Chonyi is a Tibetan term, one of the states of Bardo, a fundamental Buddhist notion, in which the soul, disassociated from the deceased body is wandering throughout mystic worlds searching for the depths of its own self and the universe. Serial technique bestows the piece with a feel of strange bodiless alienation, wanderings of a pure spirit. The album by no means is a monothematic integral whole, and the title track does not dominate it. But at the same time it is a sort of a tuning fork that serves as a cornerstone for the very different if not contrasting moods of the other pieces. The moods indeed are very different: idyllic jumble of The Pastoral; boisterous showing off of The Spanish Waltz; monotonous industrial rhythm of The Assembly Shop; introspective smoothness of The Ballad; indulgent, almost hysteric joyfulness of Sit-around Gatherings with obvious quotations from chastushki, sardonic Russian folk ditties; and finally, nostalgic impressionism of Memories of a Waltz.